Nobuo Tanaka currently serves as Chairman of the Sasakawa Peace Foundation in Japan. 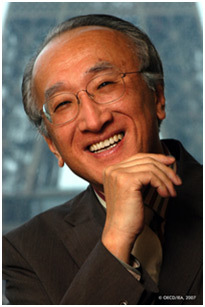 Previously served as Global Associate for Energy Security and Sustainability at the Institute of Energy Economics, Japan and prior to that as Executive Director of the International Energy Agency (IEA) Earlier in his career, Mr. Tanaka served as Director for Science, Technology and Industry at the Paris-based Organization for Economic Co-operation and Development (OECD). He began his career in 1973 in the Ministry of Economy, Trade and Industry (METI) in Tokyo. Mr. Tanaka first joined the OECD in 1989 as Deputy Director of the Directorate for Science, Technology and Industry, and was promoted to Director in 1992. In 1995, he returned to METI and served in a number of high-ranking positions, the most recent being Director-General, Multilateral Trade System Department, Trade Policy Bureau. In the energy field, Mr. Tanaka was responsible for Japan's involvement with the IEA and the G7 Energy Ministers' Meeting during the second oil crisis. In the late 1980s, he helped to establish the comprehensive energy policy of Japan and oversaw the implementation of Japan's international nuclear energy policy and negotiation of bilateral nuclear agreements. Mr. Tanaka worked on formulating international strategy as well as coordinating domestic environment policy and energy policy in the Kyoto COP3 negotiation. He was Minister for Industry, Trade and Energy at the Embassy of Japan, Washington DC from 1998-2000. Mr. Tanaka has a degree in Economics from the University of Tokyo and an MBA from Case Western Reserve University, Cleveland, Ohio. Hello Tanaka-san, it has been awhile since we talked. Before we begin can you tell us about your work at the Sasakawa Peace Foundation? I joined the Sasakawa Peace Foundation several years ago and now serve as Chairman. Our mission is promoting greater understanding, positive relationships and a dialogue between Japan and other nations on a range of important national security and peace issues. In addition to focusing on the Japan-US relationship, I am also concerned with Asia and Muslim countries. Among many trips over the last two years, I travelled to Iran eight times given its important position in energy market and its geopolitical significance. In addition to energy, maritime, cybersecurity and other areas that effect national security are important. We also focus on a number of other areas. For example we dedicate ourselves to empowering women and to make our organization into an entity where woman can work effectively and to set an example for others so that women can have fulfilling careers and to reach their full potential. A lot of your work is focused on energy and you spent several years as Executive Director of the International Energy Agency (IEA). After several years in the doldrums the price of oil and other hydrocarbon products has begun to rise at a time when very little exploration and development has been taking place given the depressed environment after the last downturn. Is this simply a cyclical recovery? What is your overall outlook over the near and medium term? Oil prices are rising because of several reasons. After an effort to provide more supply to lower prices out of anxiety over US production of shale and rising exploration in a high priced environment, Russia and OPEC made an alliance to change this prior policy and reduce output which should continue over the coming year. The demand side is also positive, given that global growth is expanded more than was expected. As before, however, as prices get higher it encourages shale and other sources of production which are not economical in low-priced environments so eventually pricing will go down - thanks to the swing supplier status of shale - so it is unlikely prices will rise precipitously and I believe the days of $100 a barrel oil are over. It is the same with gas. Australia and the US are marginal producers and will send things into oversupply and put a brake on prices. One additional point worth mentioning is that some of these incremental sources of supply such as shale are far more robust than had been imagined. While many had believed that it was uneconomical to produce at levels below about $60 a barrel, which had been part of the reason motivating OPEC to increase supply so that prices would fall below that level, in fact we have seen that production is viable at about the $45 level. So that is something that must be taken into account. 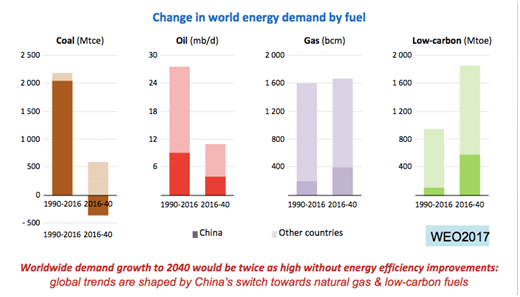 At same time China will need more gas to clean up pollution and to replace coal for gas. I was in Beijing recently and was surprised by the blue sky and that noone was wearing masks and the pollution problem was not so apparent. So gas as an energy source is slated to grow. Coal though because of pollution will play a lesser role, even with advances in clean coal technology. Few people are interested in utilizing coal as an energy source where alternatives are possible, and if India and other countries are resistant there is not much one can do about it. Further many multinationals and other companies are increasingly committed to a zero emissions policy. 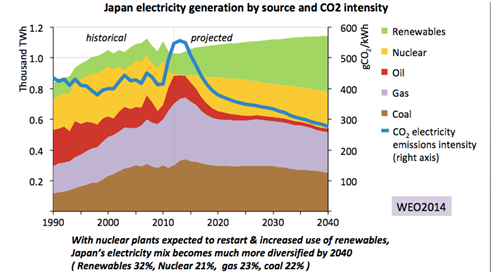 So if Japan continues to emphasize coal - even with technological advances that make it a cleaner source - that is a problem as they will fine it difficult to interface with the supply chain needs of companies seeking to implement zero emission footprints. There are more and more of these every day and this kind of pressure will make Japan reduce its emphasis on coal over time. Though for security reasons we need to maintain some usage of coal as it represents a source of diversity and element of our overall supply. That said coal can only survive if we address the need for carbon capture and storage. 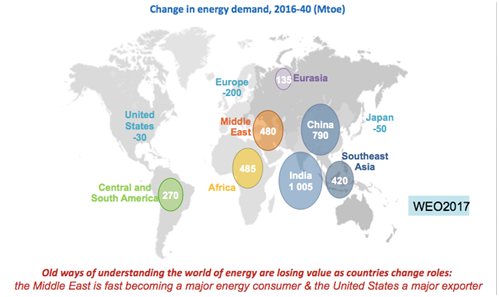 Supply and demand trends have been changing dramatically in energy markets in recent years with the US showing strong growth as an energy producer and exporter. Demand is also rising rapidly in India and even the Middle East and countries such as Brazil are moving from being net importers to exporters of oil and gas. Can you talk about these trends and what it means moving forward? There are many changes that will make the market very different from before and we need to prepare for that. Not only in terms of geography and logistical issues but also in terms of geopolitics. One recent advance in thinking is that peak demand will come sooner than later, not so much as we thought before because of supply shortfalls but rather that advances in renewables and other technologies will reduce demand. 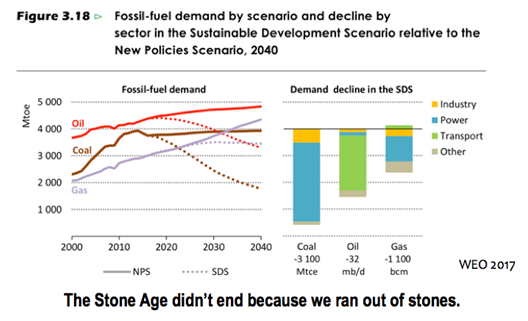 For now IEA believes the most likely scenario is that peak demand will not happen by 2040, but if climate and technological change accelerates, demand for hydrocarbons except for gas will taper and this will happen more quickly. So we need to prepare. I believe this is part of Saudi Aramco's motivation to undertake an IPO as they think peak demand might happen before it is expected. We are also seeing movement toward the development of higher value and clean products such as the extraction of hydrogen from oil so that it can be export as a clean fuel. This is a very different paradigm, clean oil recovery and is part of the changing environment before us. Technological change is also a factor. 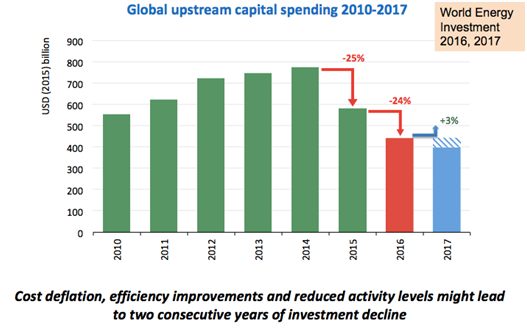 The fact is the cost of renewable is getting cheaper and cheaper and IEA's world energy outlook gives us a clear message They point to says four key changes moving forward. The first is that America will be the undisputed leader as swing producer mostly due to increases in shale production. Second, that solar will be cheapest energy source moving forward. Third, that China is in the midst of a green revolution and is presently moving toward leadership in many areas. Finally fourth, electrification and the use of electrical vehicles and other applications will accelerate moving forward. Iraq is particularly important, but the situation is fragile there and it is unclear whether the production can be sustained. Even if it can continue, it is unsure whether it will prove a reliable supply source in the future and if enough investment to maintain supply generation can be maintained given security developments there. As you have noted, one major difference between the current environment and past cycles is increased emphasis on renewable energy with many analysts believing it is now, or soon will be, feasible to rely almost 100% on renewable power. How do you see the sector developing over the next few decades? 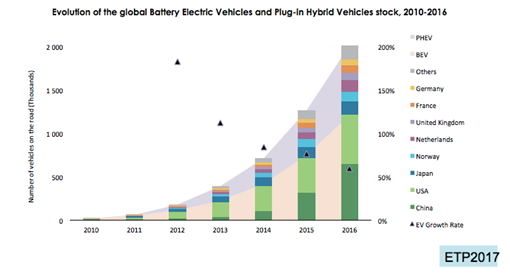 While renewables rely less on hydrocarbon products, many do not realize electronic vehicles, batteries and technology-driven hardware are dependent on cobalt, lithium, and other difficult to access natural resources. Development of these inputs is capital- and time-intensive and are often located in unstable geographies or under the control of a few suppliers. They also have their own environmental issues. Are we simply trading dependence on one group of products for another that are perhaps even more prone to supply disruptions? Rare earth minerals and some of these commodities is certainly limited in supply but I believe technology can innovate and don't worry so much about this. China tried to monopolize the supply of rare earth minerals and failed and I believe in any case we will be able to find substitutes. Perhaps over the short term there will be disruptions but I am confident that technology will provide substitutes over time. One of your main focuses over the years has been the use of nuclear power as an energy source. Advocating for nuclear power, however, has been difficult, particularly in the aftermath of the Fukushima Daiichi disaster, after which Japan closed all of its nuclear facilities. 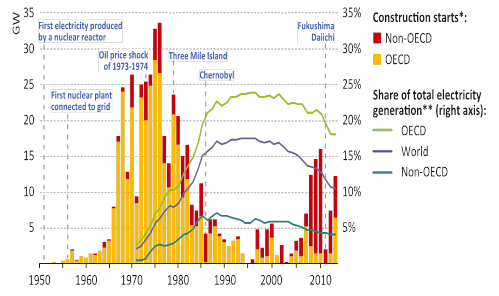 What is the present status of nuclear power and how do you see this advancing both in Japan and other markets? It remains difficult after Fukushima, but without nuclear power we are in trouble. At the same time, with the advances and cost reductions seen in renewable technologies and other changes in supply and demand patterns I think we need to recognize the age of relying on large light water reactors connected to the grid to provide base load power is coming to an end. We are not interested in building weapons but even if light water reactors are not commercially viable, small S-prism integral fast reactors can provide a solution for spent fuels and waste and improve passive safety of reactors and proliferation resistance. So this technology is very important to provide alternatives for waste and safety. Therefore this new technology can be very valuable. It is also estimated to be more commercially viable than larger scale plants, though that needs to be proven as unit costs are likely to be higher than larger plants with a larger scale. But if they can be mass-produced this might change as licensing and approvals could be easier. So that may bring costs down but this needs to be tested. My argument is that this provides solution to dispose of spent fuel and I am advocating that we can even use it in Fukushima to help clean up the toxic waste in meltdown debris created by this disaster. So this can provide a solution that will allow us to keep our nuclear capability in Kyushu, Niigata, Fukui and other locations, supplemented by a more general shift to more decentralized power, which is friendly to renewables and can change load factors quickly. Most who are engaged in the nuclear business, however, still believe in the old paradigm but a change is essential as maintaining and replacing large light water reactor plants is simply too costly and there are now better alternatives. As a result, we must shift to smaller plants and alternative models. This is a change from what we all accepted in the past though as circumstances and the outlook for the future has changed I have had to change my views as well. Nuclear though remains important for national security - both as a back-up supply and component of grid baseload and as a way to clean up spent fuels and through the use of integral small S-prism fast reactors to meet disposal needs. Presently high-level waste is estimated to take approximately 300,000 years before it's radio-toxicity is reduced to natural uranium levels and through the use of these smaller reactors it will go down to about 300 years. That is still a long time, though a dramatic reduction You are therefore able to use spent fuel and burn electricity as a byproduct in what serves as a "disposal incinerator". Given we are now seeing restarts in Japan, movement in other countries on new projects, and large uranium producers such as Cameco and KazAtomProm cutting production in the face of oversupply are we now seeing a resurgence of demand? Is there enough supply of uranium to meet future demand? We will likely not need as much uranium in the future as before. Reactor sizes are getting smaller and over time more of the older plants will go offline. While uranium is still needed demand is therefore likely to decline. Some point to China and other markets which are planning new large facilities as drivers for future increases but I don't think they will continue at the same rate in the future and we may even see them shift plans for projects now in development as the costs are too high. That is not something I might have said a few years ago but as the Solar Revolution accelerates I must change my thinking as well. Existing nuclear facilities are reaching or exceeding their estimated life cycle, with average plant age said to be about 36 years old in the U.S. and over 30 years worldwide. What will be the impact if these plants are retired and not replaced? They are not likely to be replaced with similarly large reactors given the lowering cost of renewables. The UK may build one but is not likely to go beyond that, as the cost of subsidies are too high. The costs are cheaper for gas so this will be used more in the interim until gas supplies are depleted and by the cost and capability of renewables and storage will be further improved and gradually take on that load. 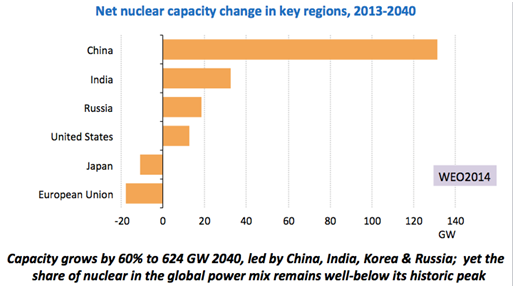 So nuclear capacity will remain an important interim energy source. The US also has more space to store waste than Japan so that is an additional advantage. Again, however, it is important to emphasize that the cost of building new reactors is so high that no one except China can potentially do this. 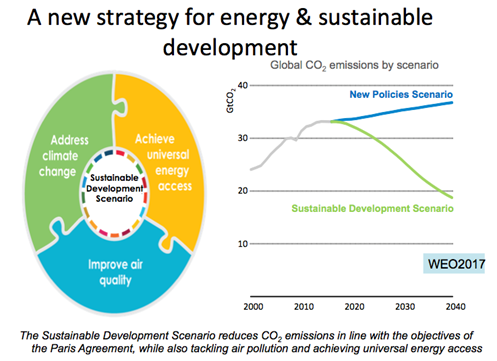 But they are also more apt to look toward solar and wind as long-term solutions. So I am very skeptical of the future of light water reactor paradigm. At the same time for geopolitical reasons we need to keep up a nuclear capability. But if light water reactors are no longer viable what can we do. That is why I am looking toward small modular fast reactors, which can maintain our nuclear capacity and also serve as a means to burn spent fuel as a kind of atomic incinerator. There are many designs being worked on in the US that may prove viable and I think these are the only viable solutions for Japan. 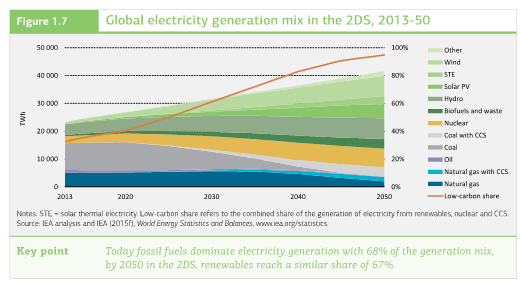 At the same time we should try to extend the life of existing plants as long as possible - from 40 to 60 years - to allow time for renewables to take over gap and to use gas as needed for the time being. Cheaper storage will help make this change possible and I hope hydrogen will also play a key role. I was not so sure about this before because the cost of renewables was so high but as noted, this is changing and these changes have led me to think we need a paradigm change, As I mentioned the price of electricity is an important component of national competitiveness and the cost of electricity in Japan is too high to promote digitalization and effects our overall cost structure. Given this need for change in Japan what should be done to help initiate this transformation of how energy and electricity is managed? This will require a dramatic change in all facets of how energy, electrification and supporting policy are managed in Japan. In Japan, the Meiji restoration was triggered by the Taisei Houkan which translates as "The Restoration of the Imperial Rule", when the last Tokugawa shogun, Yoshinobu, peacefully transferred power back to the emperor. And I think we need a similar transformation today. TEPCO is no longer credible as the major source of nuclear generation and the Ministry of Economy, Trade and Industry in which I served should think through what needs to be done. We need to restructure and transform the market so that a new paradigm can be initiated. TEPCO can remain as a transmitter and Kansai Electricas nuclear operator, unbundling and revitalizing the industry for maximum efficiency and effect. Otherwise we cannot survive and prosper, as the cost of electricity is too high. TEPCO can buy from others, even Russia and Korea which have competitive pricing and supply. The lack of of a grand design and comprehensive strategy is troubling. Government surely plays a role here. About five years ago we supported your effort to focus attention on regional Asian energy security, which resulted in a Foreign Affairs article titled Asia's Tangled Power Lines: Ensure Energy Security by Building a Smarter Grid. I note that you are also now focusing on Europe and other issues as well. Can you talk a little about this issue, as well as the progress achieved over the past few years, and what are the goals and outlook moving forward? What is happening is this. Masayoshi Son and Softbank, Roshydro and Korea Electric Power Company (KEPCO) and the State Grid of China have made a consortium to examine the feasibility of connecting these countries with Mongolia in a concept endorsed by Russian President Vladimir Putin to build an Asia Super Ring of regional power distribution. This is beginning to take shape as costs for renewables decline and storage becomes cheaper. So I think the idea of connecting with neighbors in the region is far more serious and possible than it was five years ago. I have engaged with Son's foundation to study this and to consider building underwater lines to connect Japan with Russia and the cost appears to be very reasonable. If that happens, the cost of importing energy to Japan from Russia is more viable providing there is political will. For this reason I am even more optimistic moving forward. Energy security is effected by geopolitical as well as supply factors and Russia, Iran and other parts of the Middle East, are critically important. You have also emphasized the importance of the Straits of Hormuz and Malacca as potential chokepoints. Can you give us any thoughts and insights on current developments? Also, can you talk about the potential importance of Kyauphyu as a deep sea port and a means to transport oil and gas through Myanmar into China and other parts of Asia while bypassing the Straits of Malacca? 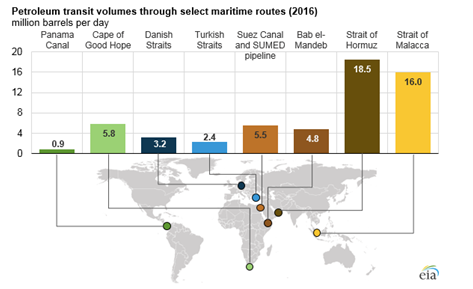 China energy security prefers pipelines over sealanes, so building pipelines and having an alternative through Myanmar to bypass Malacca makes good sense even though Hormuz remains a risk. China and India are both effected by this, even more than Japan and these countries must work seriously to create peace in Middle East. This is not as much of a problem for the US as they now have energy independence though as 90% of energy flow to Asia goes through Hormuz we need to get serious at a time when we are not seeing much leadership from US. I am very scared about policy with Iran. If the US aborts their agreement with Iran they will likely start building nuclear weapons and Saudia Arabia may follow. This is a huge problem. Qatar is also being pushed to become closer to Iran and has experienced some tensions within the region - though their export of LNG was not disturbed but the politics are complicated. Japan has suffered through decades of economic decline since the asset price "bubble" collapse in 1991, a condition that has been compounded by deflation, demographics and a range of other issues. After several unsustainable starts, market performance has again turned positive over the past year and investors are starting to take notice. What are your views on the Japanese economy? Have we entered a more sustainable recovery phase? 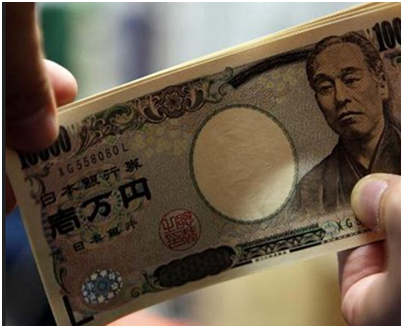 What is the mood in Japan and status of Abenomics and the "third arrow" reform program? The Abe government is very popular and his opponents are very weak and politically everything is very stable. He has also been very successful in dealing with Trump - but the issue of geopolitics in Asia is very complicated particularly in terms of North Korea. All the players will hopefully engage for stability but who knows? The US needs to engage more in Asia. We understand the administrations desire to put "America First" but that only goes so far. As you noted, we are experiencing an economic upswing and we are starting to grow but the challenge of sustainability is still here and preparedness for clean energy and the Us Sustainable Development Goals and environmental, social growth is not being taken as seriously by corporations in Japan as in other markets. That is a problem and in many ways we are losing the lead to China is these areas. Economic reform is proceeding but as I said government is not moving far enough on energy and that has an effect on our cost structure. Demographics and complacency are real barriers and they must be addressed for a sustainable recovery and future. In the past few years we have seen a resurgence of populism and the election of Donald Trump as President of the U.S. How do you view the current direction of the US as well as the global rise of populism and its impact on the world economy? Populism is a challenge for democracy though the US has made mistakes in the past and recovered through trial and error and often become stronger as a result. So I am optimistic that while populism is creating problems the US will come back over time. Unfortunately, however, the US presence in Asia has deteriorated and my hope is that the US will return soon than later as it has a major role to play and the region represents the major source of economic growth moving forward. Key decisions and movements are now taking place and the economic strength of the US as well as the region itself will depend on its participation. Finally, what do you make of the U.S. pullout from the Paris Accord and Trans-Pacific Partnership Agreement (TPP) as well as the shift toward bilateral over multilateral accords? What is your view of this move both for the U.S. and for global trade, investment, the environment and economic stability moving forward? The US is moving away from multilateralism and the UN and other institutions and generally retreating from international structures and the lack of leadership from US is creating a vacuum. China loves this and is pleased to begin taking its place. 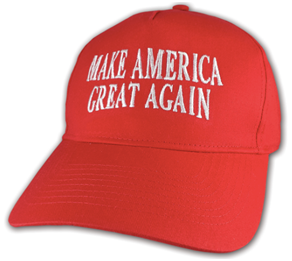 That said, I don't worry about Paris as even if Trump pulls the US out of this agreement, many large blue states in the US, for example California, New York and Illinois continue to maintain stringent standards as do large multinationals- so whatever Trump says, the impact of business has not been too serious and the commitment remains there. As for the TPP, as I said the lack of US participation and leadership in the region is creating a vacuum, which China is now moving to fill. I really hope the US will recognize this is not in its or the region's long term interests and will reenter the talks and reengage for the benefit of the world at large. Thank you Tanaka-san for your time and attention. Before we conclude is there anything else you would like to note for our readers? Current trends and forecasts for the future indicate we may be closer to peak demand for oil than previously believed. This was a worry in the past, which was largely forgotten as rising prices led to new exploration and supply sources such as shale from the US. Today, however, we are seeing renewed concern, but not so much from lack of supply - but rather diminishing demand as electric vehicles and the rising competitiveness of renewables become increasingly important, as they are becoming both economically viable as well as for environmental reasons. Many believe this is the motivation behind Saudi Aramco's plans for a public offering so that Saudi Arabia can diversify and make its economy less dependent on petroleum. The key point I would like to leave with your readers is one made sometime ago by former Saudi Minister of Petroleum and Mineral Resources and Minister in OPEC Sheikh Ahmed Zaki Yamani which is that the Stone Age didn't end because we ran out of stones. Rather we evolved and over time new technologies emerged as a result. Thank you. Hope all remains well and look forward to speaking again soon.